A while back, I spent a whopping $5 on this 50-movie DVD set, Sci-fi Invasion. That adds up to 10 cents per movie. Up next is The Day Time Ended, from 1980. Here’s what happens: A family moves a ranch way out in the middle of nowhere. On their first night in their home, aliens show up, invade the house, and eventually transport the family through time and space. 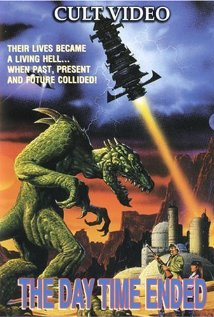 Speculative spectacle: Aliens, laser beams, and giant monsters? Well, all right then. Sleaze factor: Zero. The filmmakers are going for a family-friendly, Spielbergian vibe. 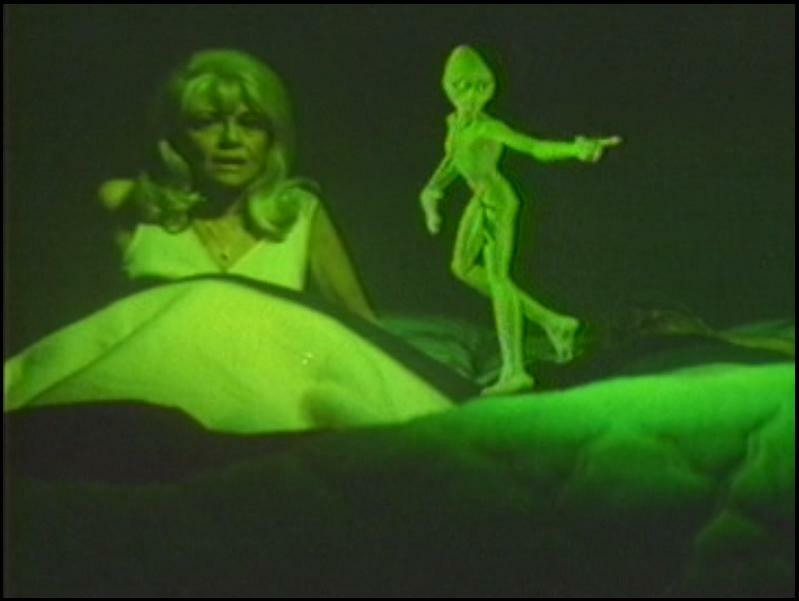 Quantum quotables: “Have you seen my new pony?” –What any little girl would say when a glowing green alien spaceship lands right in front of her. What the felgercarb? The aliens, spaceships, and dinosaur-like creatures are all captured with stop motion animation, which is good, but why is that one tiny green alien ballet dancing? Microcosmic minutiae: The dad is played by Jim Davis. I looked it up and, no, it’s not the same Jim Davis who draws Garfield. Worth 10 cents? Substitute “aliens” for “ghosts” and this movie is pretty much doing what Poltergeist would do a few years later. The Day Time Ended, though, doesn’t have any of that movie’s budget or talent. Keep the dime and watch Poltergeist instead. Check out my book, CINE HIGH, now available for the Kindle and the free Kindle app.